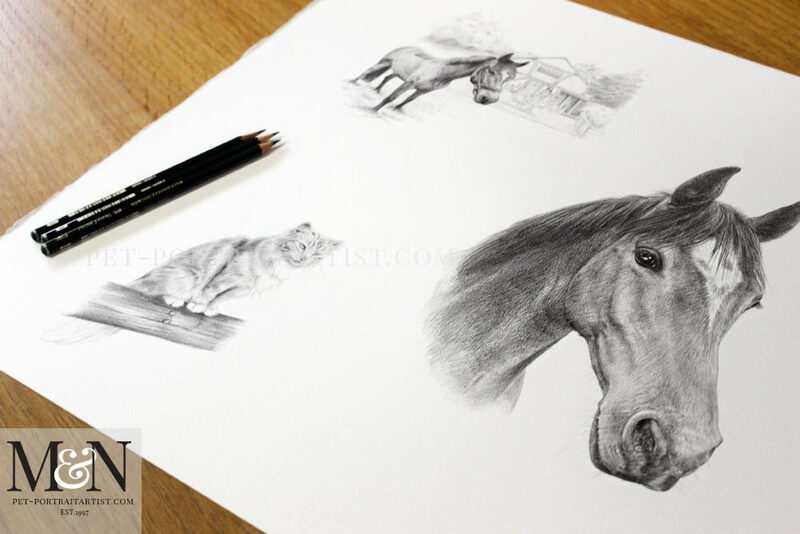 Welcome to my latest horse pencil portrait montage! The horse in question is called Locksie and the portrait was commissioned by my client William here in the UK. The portrait was an 18 x 24 montage pencil drawing. It was traditionally hand drawn by myself, Melanie, here in my studio in the heart of Wales. 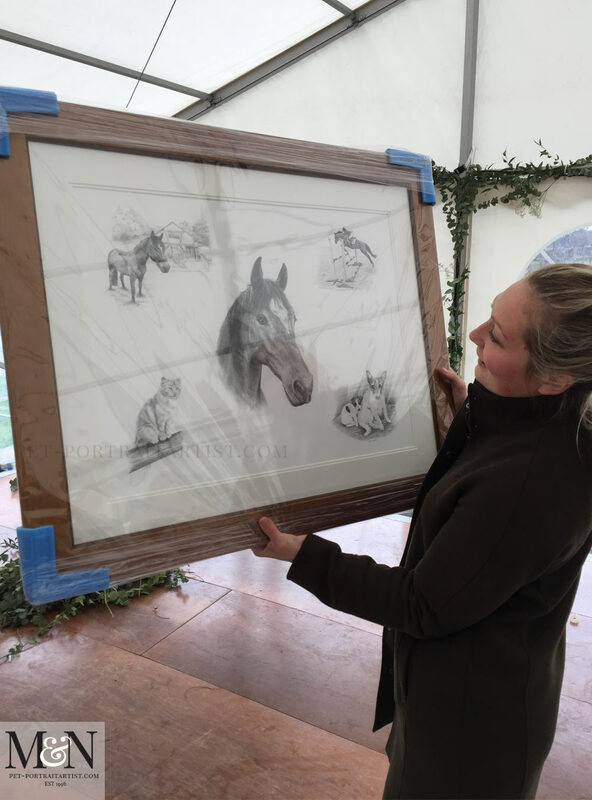 William commissioned the drawing to give as a wonderful gift to his wife Annabel on their wedding day in April 2018. Thankfully William emailed me lots of lovely photos of Locksie along with photos of their cat and two Jack Russell dogs which he wanted included. 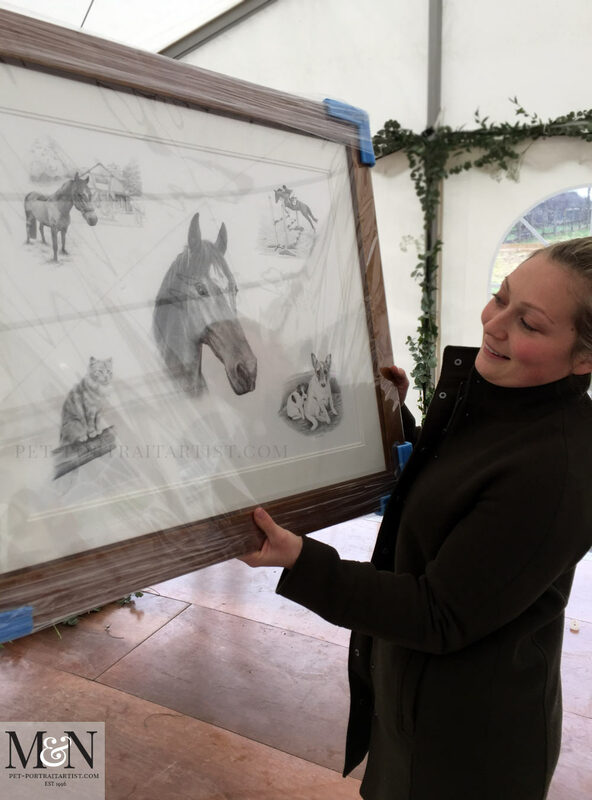 He chose to have a montage portrait so that it could depict all of their pets, along with a portrait of Locksie standing in front of a barn. Also one of Annabel jumping with Locksie. All of the photos William chose have meaning to himself and his wife Annabel. It will make a beautiful gift on his wedding day, plus something to treasure for many years to come. William emailed when he saw the finished portrait and I have added it below. I have also added some photos of the portrait with my pencils and when it was framed below…. I absolutely love it and I’m sure Annabel will to!! Thank you very much it’s better than I imagined it to be. William emailed me some lovely photos of Annabel with her portrait. Also a lovely testimonial from William below too! If you scroll down past these photos you can see images of the portrait unframed on the plan chest in the studio with my pencil to help show scale. Hope your well, sorry its taken me a while to email you! Annabel absolutely loves her present! Thanks again for all your hard work! I often find my pencil portrait scans are quite harsh, not a good representation of the finished drawings. So I like to take photos of my artwork on our plan chest in the studio. We have plenty of light coming through our windows both sides of the studio and this really helps for taking photos and video fo our work. I always add my pencils on the drawings to help give scale to the portraits. 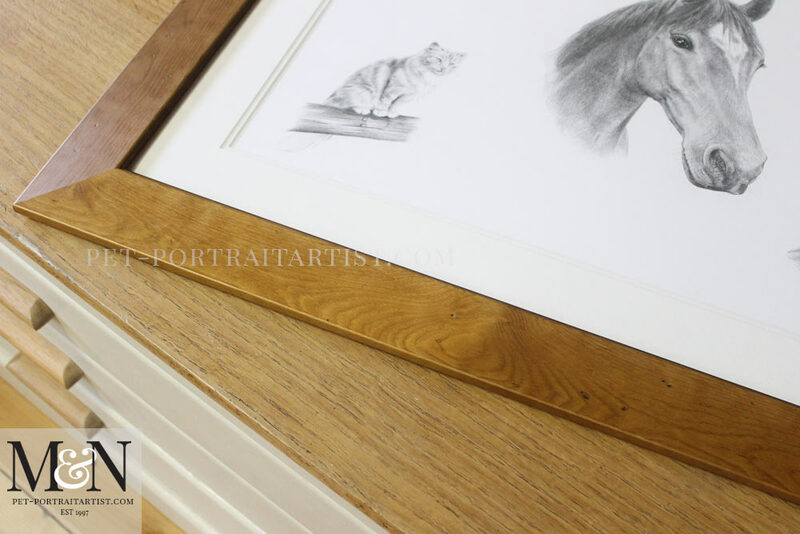 The portrait was framed using a plain pine wood frame which works beautifully with my drawings. The richness and warmth of the wood tones are absolutely lovely. It has a double mount too which adds interested and emulates the detail on the edge of the frame well too. I hope you like the photos below. If you would like a portrait of your pet as a montage, just drop me a line. I would love to discuss it with you. 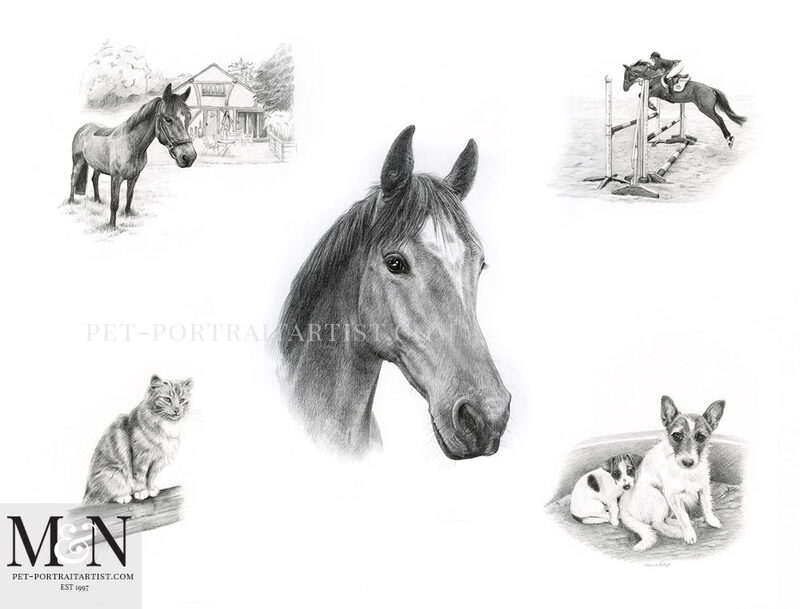 You can email me direct or head on over to my pencil pet portraits website and use my contact page. 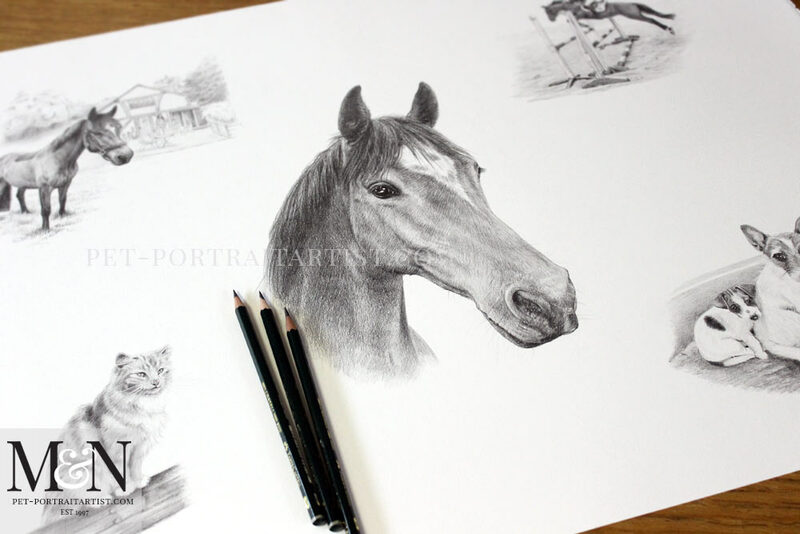 While you are on my website, you can check out my pencil portraits gallery along with an FAQ’s page. 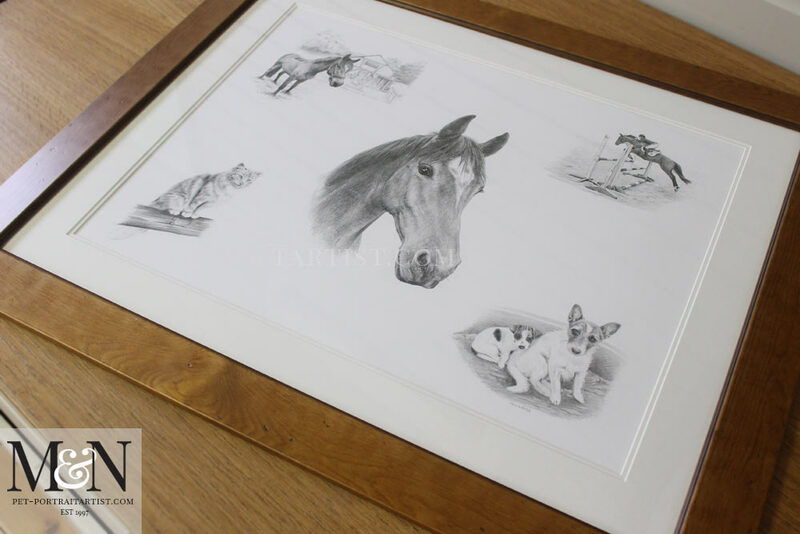 You can also see how to take photos of your pet and follow a live commission from start to finish too. This often helps prospective clients have a feel for how the whole process works from initial contact, right through to packing the portrait. I am looking forward to working with you! You are very talented and understand the bone and muscle structure intuitively. I was an artist myself until my eyesight let me down and I recognise brilliance when I see it. Well done, perfect!